When No. 2 USC and No. 21 Stanford face off this Saturday in a battle of Pac-12 heavyweights, it will be the fifth time the teams have met since the Cardinal’s historic, 24-23 upset of the Trojans on Oct. 6, 2007, often considered the greatest upset in college football history. Led by first-time starting quarterback Tavita Pritchard, the win sparked the revitalization of Stanford’s football program under head coach Jim Harbaugh, and later, current coach David Shaw. 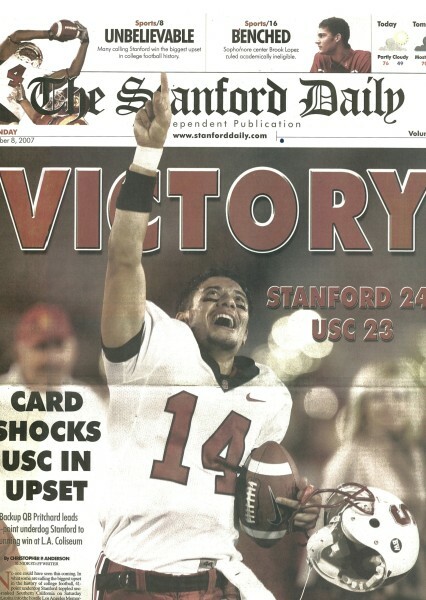 To commemorate the anniversary of perhaps the best game ever played by a Stanford team, here is The Daily’s own recap of that victory, originally published on Oct. 8, 2007. No one could have seen this coming. In what some are calling the biggest upset in the history of college football, 41-point underdog Stanford toppled second-ranked Southern California on Saturday night, going into the hostile Los Angeles Memorial Coliseum to shock one of the nation’s most storied programs, 24-23. Redshirt sophomore Tavita Pritchard, making his first career start, lofted a 10-yard touchdown pass to Mark Bradford on fourth-and-goal with 49 second remaining to give the Cardinal its first lead of the game. Bo McNally’s fourth-down interception of USC quarterback John David Booty on the ensuing possession sealed one of the biggest wins in Stanford football history and gave head coach Jim Harbaugh his first Pac-10 victory. The win was Stanford’s first against the Trojans since Sept. 29, 2001, which was also the last time USC lost at home to any opponent.The Cardinal victory snapped the Trojans’ 35-game home winning streak—the nation’s longest—and gave USC head coach Pete Carroll only his third home loss since he arrived in L.A. six years ago. The Cardinal (2-3, 1-3 Pac-10) defeated the Trojans despite being outgained 459-235. Booty threw four interceptions—including one that was returned for a touchdown and another that set up the winning score—and junior defensive end Pamel Egboh blocked what turned out to be a decisive extra point. Stanford forced five USC turnovers while committing only one, and executed masterfully down the stretch, including two fourth-and-long conversions on the final drive. Harbaugh began hyping this game in the spring, when he openly speculated that Carrol might leave ‘SC for the NFL after this season. When Carroll called out the outspoken Stanford coach, Harbaugh refused to back down. Southern California, winner of 24 straight home Pac-10 contests, wilted under the emotional fire of a Stanford defense missing its starting nose tackle and playing two of its best defenders with chronic injuries. USC—which came into the game ranked second in the Associated Press poll and first in the coaches’ poll—had played tentatively all season, lacking explosive playmaking and playing mistake-prone football in last week’s 27-24 escape at Washington. A slew of injuries thinned the Trojan roster, including several on the offensive line and in the secondary. Booty suffered a broken middle finger on his throwing hand in the first half, which may have contributed to his costly bout with inaccuracy down the stretch. USC’s running game, featuring a stable of talented tailbacks, was held to only 124 yards (not counting sack yardage). The Trojans had averaged over 240 rushing yards per game coming in. The Cardinal made USC pay for every one of its second-half mistakes, scoring 10 points on its final two drives, both set up by interceptions. After senior Derek Belch kicked a 26-yard field goal with 5:43 on the clock to cut the USC lead to 23-17, the Cardinal defensive unit responded with one of its best series of the contest. A second-down sack by redshirt sophomore Clinton Snyder was followed by junior cornerback Wopamo Osaisai’s interception on third-and-19, giving Stanford’s offense the ball on the USC 45. Pritchard led the Cardinal to the USC 29-yard line, where Stanford was faced with a do-or-die fourth-and-20 with under two minutes left in the game. The young quarterback, starting in place of injured senior T.C. Ostrander, couldn’t hear Harbaugh call the play in over the noise of the 85,125-strong crowd and was forced to make the call himself. The result was a 20-yard completion to sophomore wide receiver Richard Sherman—who absorbed a huge hit as he caught the pass—just inches beyond the first down marker at the USC 9-yard line. After gaining five more yards on a bootleg keeper, Pritchard threw two incompletions intended for senior wideout Evan Moore. On fourth-and-goal from the 5, Stanford was penalized five yards for illegal substitution, a call that gave Pritchard more space to toss the deciding fade route to Bradford. With USC fans screaming in his ear, Pritchard calmly dropped back into the pocket and lofted a perfect fade pass into the left corner of the end zone and fourth-and-goal from the 10-yard line. Split out to the left, Bradford gained outside position on his defender, leapt into the air and made an acrobatic catch, dragging his feet inbounds for the game-winning touchdown. Belch’s extra point gave the Cardinal the lead—its first of the game—and after sophomore defensive back Bo McNally’s interception, the Stanford party was on in the Coliseum. Pritchard finished 11-of-30 for 149 yards, but went eight for his last 15 and consistently evaded defensive pressure with his mobility. USC’s offense pounded away in the first half, outgaining Stanford 222-74, but went into the locker room with a slim 9-0 lead. Senior cornerback Nick Sanchez stuffed USC tailback Chauncey Washington on fourth-and-goal inside the three-yard line in the closing seconds of the first half, and USC jogged off the field to a chorus of boos—the first of several from an increasingly restless Trojan crowd. USC’s methodical offense gave way in the second half to a focus on big plays, including one that went in Stanford’s favor. On third-and-one from his own 28-yard line, Booty double-clutched on a pass and threw right into the arms of sophomore safety Austin Yancy, who returned it 31 yards down the sideline for the Cardinal’s first touchdown. It was one of three drive-killing turnovers in the third quarter that kept USC from pulling away. Fresh off Saturday’s stunning victory, the Cardinal faces TCU (3-3, 1-2 Mountain West) next Saturday in the homecoming game at Stanford Stadium. Kickoff is scheduled for 2 p.m.
-In this week’s AP poll, USC fell to No. 10; the Trojans fell to No. 7 in the USA Today coaches’ poll. Stanford received four votes in each poll. -The game was broadcast on the niche cable network Versus, which will replay the broadcast today at 1 p.m.
-The Stanford win is the largest to overcome the point spread in Division I-A football history. -After the Stanford Band performed a halftime show mocking USC alumnus O.J. Simpson, the Spirit of Troy marching band recreated “The Play,” California’s controversial five-lateral kickoff return that won the 1982 Big Game, 25-20.